The San Francisco Bay Area has long been a hotbed for emerging music scenes and styles, attracting adventurous musicians and voracious music fans. Both are rewarded each year during the Noise Pop Music Festival – a city-wide event that invades San Francisco’s historical venues. Noise Pop hits San Francisco today, February 19, through February 28. Noise Pop’s humble beginnings sought to highlight the local talent and support the city’s venues. The festival has since become an annual staple of the Bay Area, booking major acts such as The Shins, The Flaming Lips, Modest Mouse, Sleater-Kinney and the list goes on. Don’t let the bigger names fool you, though. Substantial growth has not caused the festival to stray from its original premise of showcasing promising up-and-comers and underground favorites. This year is no exception with a line-up including American Football, Carly Rae Jepsen, Drive Like Jehu, a solo performance by The Mountain Goats, Neon Indian, Bill Callahan and loads of other amazing artists. To kick off our official eventseeker podcast — Podseeker — we turn our focus to this year’s fest! 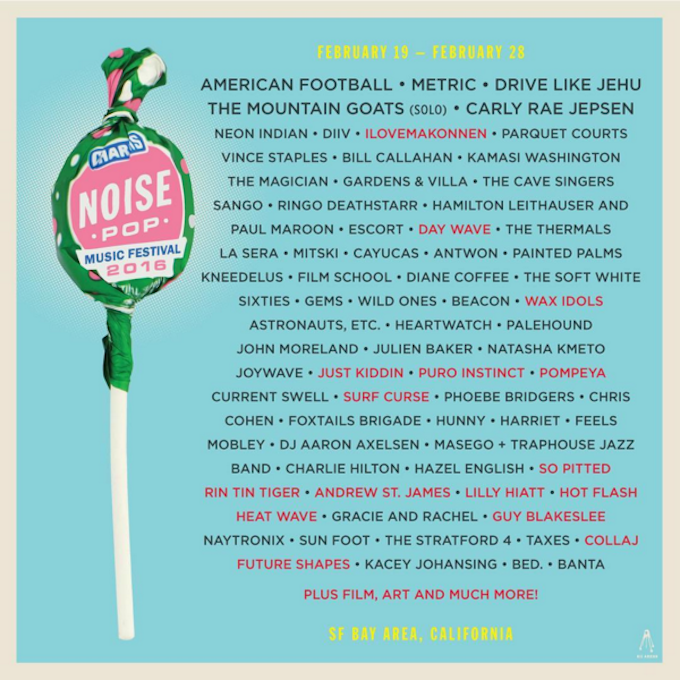 Along with Noise Pop Marketing Team Megan Mayer and Lamont Harper, we discuss the festival’s colorful history and all things Noise Pop 2016.